In Part I of our blog post, we covered the machine learning models used to create our recommender system. Part II of our blog will go through the technical implementation of our pipeline. After reading countless blog posts by fellow engineers creating similar pipelines, we were unable to find one with a detailed explaination of their process. For that reason, we wrote this blog post to serve as a guide for others. All code associated to this blog post can be found in our github repository. 1. Can it be built in two weeks? 2. Can we each work on our parts of the Capstone without impacting each other? Being a team of five, we had to be intentional about how we distributed and then integrated the individual pieces that made up our project. 3. Are we using the appropriate technology and is it scalable? With the popularity of "big data" in the tech-world, we wanted to make sure we were using the appropriate tools for our project. Additionally, our project needed to be scalable. Amazon Web Services (AWS) offered the flexibility to allocate the appropriate number of resources, allowing you to upgrade/downgrade your configuration based on computational needs. Apache Spark - a fast and general engine for large-scale data processing: This is where our machine-learning models were trained and data was processed. Flask - a microframework for Python: Our front-end web application. Apache Kafka - a distributed streaming platform: The connection between our front-end (Flask) and our models in Spark. Having the least familiarity with Kafka and Spark, we began with those two components and integrated our Flask App once we had succesffully implemented a connection between Kafka and Spark. Google (Cloud), Amazon (AWS), and Microsoft (Azure) all offer free trials for their cloud computing services, providing a nice option for students to gain familiarity with the world of web services. For our project, we decided to use Amazon Web Services. Both Spark & Kafka will be installed on Amazon EC2 Instances. As touched on above, we used Kafka to stream information from our webapp into our machine-learning model and then send new information back to our webapp. If you'd like more information on Kafka, they provide a nice introduction with more details on its API and various configurations. Log into your AWS dashboard. From your AWS dashboard, click on the launch a virtual machine wizard to create a new instance (this will be where you will run Kafka/Spark on). We used a t2.medium type on an Ubuntu Server, though a t2.micro instance-type can also be used. "ssh -i "location of pem key" [email protected]_dns_address"
5. AWS configures your EC2 instance to only be accessable via SSH and on your current IP Address. If you need access from another IP Address, you can do so by changing the allowed IP's in your Security Group settings in AWS. ZooKeeper: Apache server configuration service that Kafka runs on. Kafka Server: The Kafka server that streams will be streamed through. Topics: Topics can be thought of as channels where data can travel through. A server can have multiple topics and each topic can have multiple subscribers. Producers: Produces data to the specified topic. Consumers: Consumes data from the specified topic. If you are running a t2.micro EC2 instance, you will need to reconfigure your ZooKeeper and Kafka server script to prevent your instance from running out of memory. Use your preferred editor to update the .sh file and replace the memory size to 256MB. On your screen, launch a ZooKeeper server (note: you must be in Kafka's home directory). The ZooKeeper acts as the server. Launch a new screen. Screen lets you to have multiple "screens" running at once, allowing you to run .sh files on their own unique screen. Exit out of the screen by typing ctrl+a and then d. This keeps your server running and to continue working on your instance. Again, exit out of the screen by typing ctrl+a and then d. The default ports for your ZooKeeper & Kafka server are 2181 & 9092, respectively (additional Kafka servers use ports 9093, 9094, ...). To configure Spark on an EC2 instance, we followed this step-by-step guide. 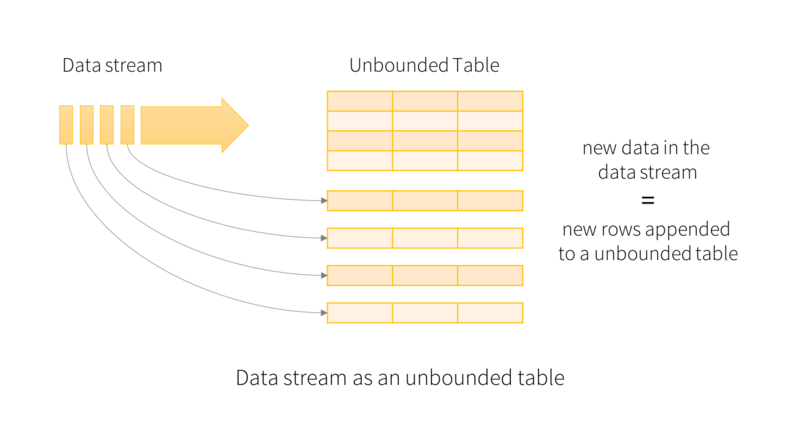 To read our Kafka streams into Spark, we used Spark's Structured Streaming platform. Structured Streaming provides fast, scalable, fault-tolerant, end-to-end exactly-once stream processing without the user having to reason about streaming. Structured Streaming simplifies the syntax for reading and writing streams, replacing read() & write() with readStream() & writeStream(). Each new line of data being streamed into Spark can be thought of as an appended observation to an unbounded table, as visualized above. This script will be used to test the communication between Spark, Kafka, and your local machine, confirming that all three components can communicate with each other. The video below shows each of the three sections of our pipeline in communication. The top-right corner is the Python code above, running on our local machine. The middle section is a Kafka consumer, showing each stream being consumed by Kafka. The bottom section is the Spark console, showing Spark reading in each observation and writing it out to the console. After confirming that our pipeline was working, we were then able to move on to integrating our machine learning models and connecting to our Flask application, which can be found in Part 1 of our blog post.